Perfect World Entertainment has announced the release of Hob: The Definitive Edition for Nintendo Switch. The 2017 PC game was originally developed by Runic Studios (Torchlight, Torchlight II) and has been ported to Switch by Panic Button. The game is $19.99 with 10% off through April 17th. 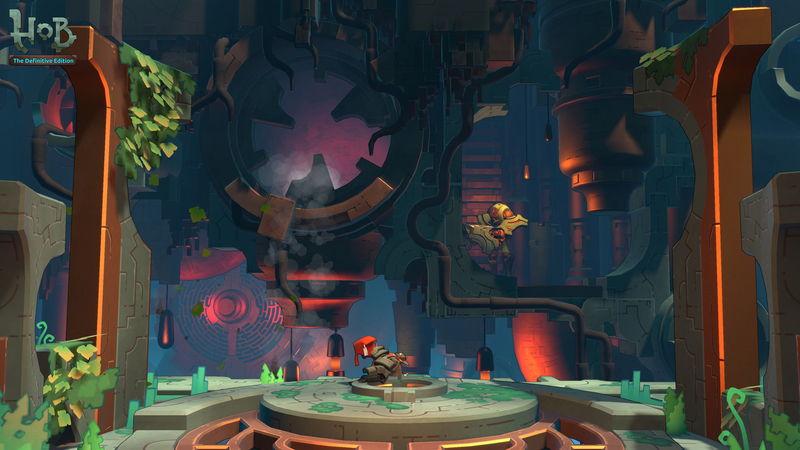 Hob challenges players to adventure through a planet in peril while solving puzzles and taking on the denizens out to destroy the world. The Switch version includes exclusive features such as HD rumble and full touch-screen functionality and some quality of life improvements, UI changes and additional camera options. Uncover the Mystery - The world of Hob is full of mystery and wonder. Players will unravel the planet’s secrets as they explore and interact with the strange lifeforms that inhabit it. Transform the World - By solving puzzles and repairing the world, adventurers will watch the landscape change before their eyes, opening new areas to uncover and explore. Unlock New Powers - Upgrading the mechanical glove-arm will reveal new abilities that allow gamers to grapple, punch, and warp their way through the world. Adventure - Hob invites adventure seekers to traverse an open world, explore ruins, befriend sprites and battle the rogue creatures that threaten their extinction. The Ultimate Hob Experience - This all-new version includes Nintendo Switch exclusive features like HD Rumble and touch screen support, and refines the original game with increased camera control options, streamlined menus and a reworked campaign that make discovering the world of Hob better than ever.